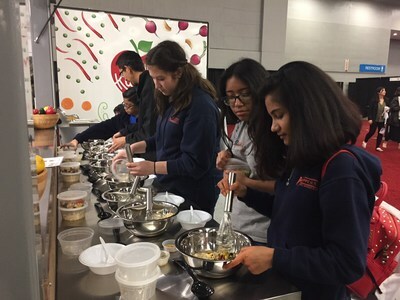 CHICAGO, March 9, 2018 /PRNewswire/ -- This week, food and nutrition education took center stage at the 2018 SXSW EDU Conference & Festival when Chartwells K12, a team of chefs, dietitians and operators who cook and serve meals in more than 4,000 schools across the country, took its Mobile Teaching Kitchen to the annual event that brings together teachers, school administrators and education innovators in Austin, Texas. Elly, Chartwells K12’s Mobile Teaching Kitchen, unboxed and ready for students to learn about food, cooking skills and sustainable choices. Students at SXSW EDU cooking up change by making Aztec Quinoa Grain Bowls at Elly, Chartwells K12’s Mobile Teaching Kitchen. During the event, Chartwells' introduced Elly The Mobile Teaching Kitchen – named after Chartwells' principles of Eat. Learn. Live. – to thousands of students, teachers and other education innovators. Elly is a shipping container-turned-kitchen that has traveled thousands of miles to cook up change in schools. At the SXSW EDU Learning Expo, visitors had the opportunity to understand how Elly engages, inspires and teaches kids about food, cooking skills, and sustainable choices. Students also learned new culinary skills by creating an Aztec Quinoa Grain Bowl recipe. "We have both the opportunity and the responsibility to help our children make healthier choices for life," said Belinda Oakley, CEO, Chartwells K12. "We know our responsibility extends beyond the four walls of the cafeteria so we consider food and nutrition education a key commitment to the partners and communities we serve." In addition to featuring Elly in the Learning Expo, Oakley presented at SXSW EDU on "Cooking Up Change To Teach a Healthier Generation." This session showcased how Elly, along with a number of other Chartwells K12's food and nutrition education programs, is reinventing the perception and experience of serving food in schools. 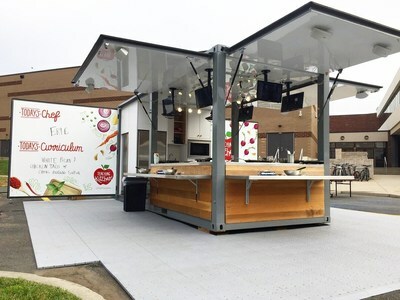 The team at Chartwells K12 created Elly as a way to bring chefs and students together to engage them in exciting, hands-on cooking just like they see on TV. After one year on the road, Elly has traveled 3,000 miles and cooked with nearly 2,800 kids. Elly was inspired by the Teaching Kitchen Collaborative, a collaboration between the T.H. Chan School of Public Health at Harvard and the Culinary Institute of America. "Over the past year, we've seen Elly The Mobile Teaching Kitchen have a positive impact on short-term behaviors, but we have long-term intent," continued Oakley. "We're giving them the knowledge, tools and skills they need to discover real food, make wholesome meals and advocate for healthful change within their communities." Emerging research demonstrates that hands-on cooking, along with nutrition education, are critical tools in creating healthful behavioral changes among both kids and adults. Through quantitative research evaluating Elly's activities, Chartwells K12 can already see that a teaching kitchen lesson is an effective way to impact eating habits and behaviors. Results found that 86 percent of kids who've been through the teaching kitchen class say they're more likely to try new foods. And nearly 9 out of 10 kids have greater confidence in their ability to cook. This spring, Elly's journey continues to the Western half of the United States where she will reach thousands more of students who are hungry to learn. Chartwells K12 provides dining programs for school districts across the country and prides itself on extending its dedication, knowledge, and enthusiasm into building custom programs that deliver each student delicious, great tasting meals. With more than 14,000 associates in 4,000 schools, ranging from large public institutions to small charter and private schools, Chartwells K12 is built on decades of food, education and operational experience driven by top culinary, nutrition, wellness, and sustainability talent. For more information, visit www.ChartwellsK12.com.